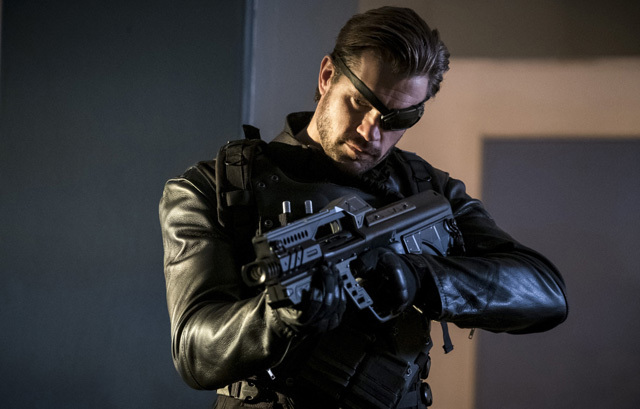 The CW has released the first photos from The Flash Episode 3.10 which give us a first look at Stephen Huszar as the expert marksman Plunder. Let us know what you think of Plunder in the comments below. Episode 3.10 of The Flash is titled “Borrowing Problems From The Future” and is set to air Tuesday, January 24 on The CW. Grant Gustin stars as Barry Allen/The Flash in the series along with Candice Patton as Iris West, Danielle Panabaker as Caitlin Snow, Carlos Valdes as Cisco Ramo, Tom Cavanagh as Dr. Harrison Wells and Jesse L. Martin as Detective Joe West. Season 2 of the series also introduced Keiynan Lonsdale as Wally West and the Earth-3 version of The Flash as played by John Wesley Shipp (who also played Barry’s father, Henry Allen) who continue to guest star in the series. Season 3 also features Tom Felton as Julian Albert.